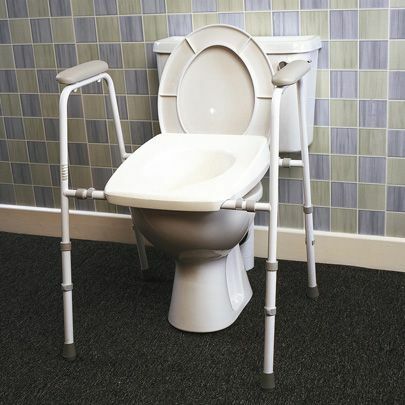 This toilet frame can be assembled or disassembled without tools for storage or transport. It has padded armrests for additional comfort and easier grip. It offers hand grip and also a rest for the forearm. The armrests are flame retardant PVC with welded seams. A height and width adjustable metal frame to which clips a one piece moulded seat, with integral skirt protruding down into the toilet. The broad seat is contoured and feels warm to the touch for added comfort.The front has a partial cut-away to facilitate personal hygiene, but still offers a splash guard. The legs are fitted with rubber non slip feet.